Our director Chris Heuvel is one of only 15 architects to be awarded Royal Institute of British Architects Fellow status in the 2018 list. The RIBA says of the award that "Fellow Membership gives us the opportunity to recognise our inspirational Chartered Members, the sometimes unsung heroes of the profession, who have made a real contribution to architecture, and the community." "Chris is a Director at 2hD Architecture Workshop and a lecturer at Nottingham Trent University (NTU), where he delivers the professional practice elements of both the undergraduate and postgraduate architectural programmes, in addition to acting as Professional Studies Advisor for students in practice. He also runs the Design Studio module followed by first year undergraduates. Chris champions architectural education as an integral aspect of professional practice, and is currently undertaking a major research project on behalf of NTU into how practitioners’ engagement with their local communities can be compatible with their business development objectives. All his teaching is substantially informed by a lifetime of active involvement in community engagement projects – previously in Norfolk and now in Nottingham, where (in conjunction with 2hD Ltd) he is currently helping a local group develop a business plan for the revival of their recently closed community centre." Congratulations Chris, the recognition is thoroughly well deserved! Can architectural skills help save a local landmark? 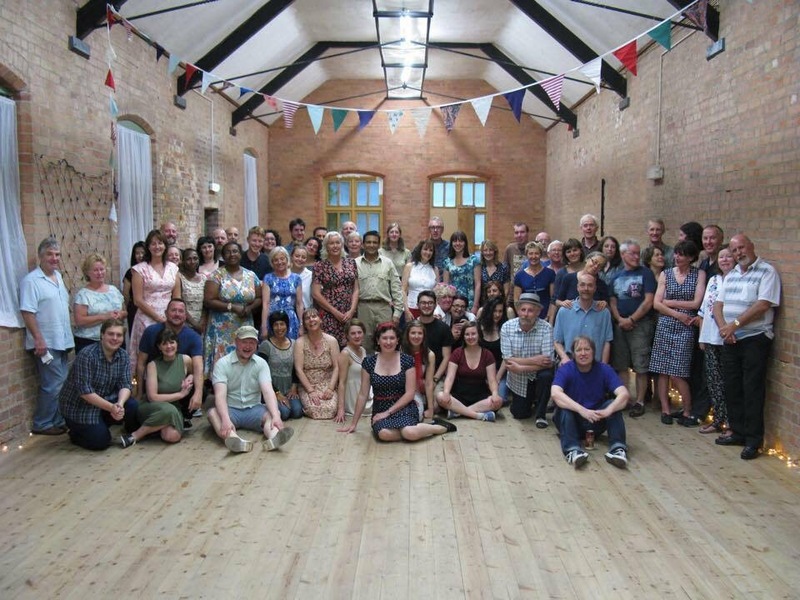 Tom and Chris have been working with a 'community alliance' in Sneinton, Nottingham. A local historic building, much loved by the community, is under threat of demolition. 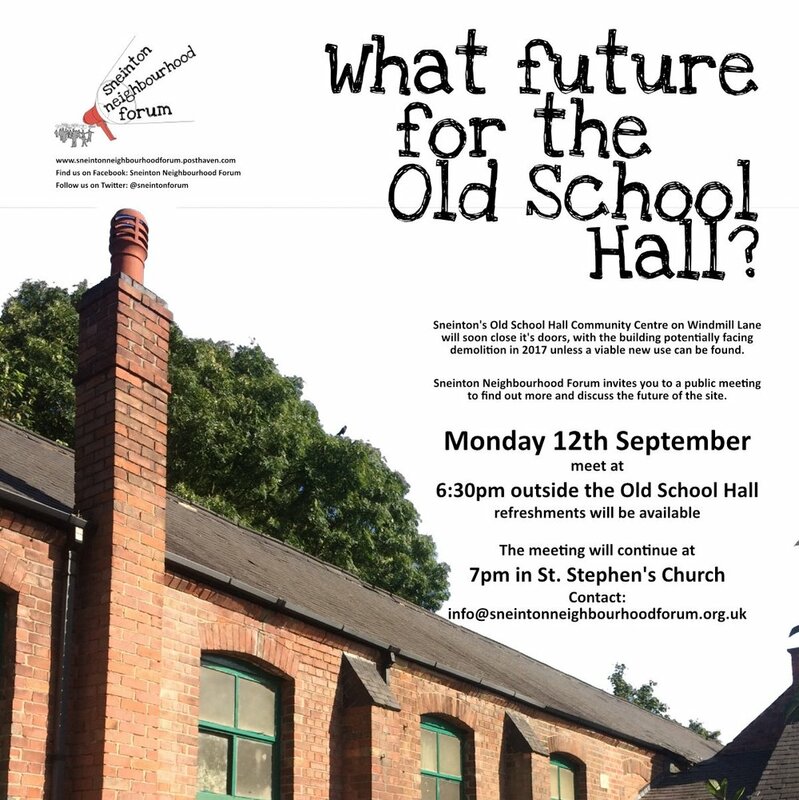 We've offered our community engagement and architectural skills to "dOSH" (Development of the Old School Hall) which has formed to find a sustainable use for the site. Bringing the community together to share knowledge and ideas. The Old School Hall building dates from the 1840s. Originally a school standing on the boundary between Sneinton and Nottingham, the building served generations of pupils. When in the 1960s a new modern school was opened just up the road, the Old School Hall community centre was created on the site. Many local residents have positive associations with the building as both a school and community centre, so the news that it had closed, and would face demolition, came as a significant blow. By happy coincidence at this point, Chris was putting the word out to community groups, offering free consultancy as part of his research at Nottingham Trent University. He has been advising the dOSH group on understanding the existing building, seeking advice on the structural stability and condition including liaising with structural engineers and reviewing existing condition reports. The challenges facing the group are extensive, but the collaborative approach we have helped to foster, in getting organised and understanding both problems and visions, has started things off on the right foot. We were out and about in Sneinton, the area around our Nottingham base, yesterday as part of a research project at Nottingham Trent University's School of Architecture and The Built Environment. This was an orientation walk for researchers and student volunteers involved in a project to map Nottingham's identity, and we were able to contribute our local knowledge of the area's history and recent developments. Leading the walk was Community Organiser Shabana Najib of Sneinton Alchemy, who are the local community partners in the project. The research will also cover Carrington in Nottingham, with outputs and further engagement planned for the Nottingham Central Library in September. You can find out more and get involved via the research project blog. In conjunction with my research into how architects can develop their practice through engagement with members of a community, I will be hosting a talk by Lewis Jones of the 2015 Turner Prize winning collective Assemble. My interview will be conducted in public as part of the Norfolk Contemporary Art Society's programme in The Curve Auditorium, Norwich Forum on Wednesday 6th July 2016 at 7:30pm. For more information, see the NCAS website. Jayne Sunley, Knowledge Manager at BSRIA said, “We’re delighted with the variety and inventiveness of the entries submitted. Tom’s idea stood out as a genuinely practical and interesting way of tackling the performance deficit of buildings. So many problems occur at junctions, rather than within components themselves, it is an obvious place to focus attention”. You can read more about my entry and the other great ideas from the runners up on the Designing Buildings Wiki. 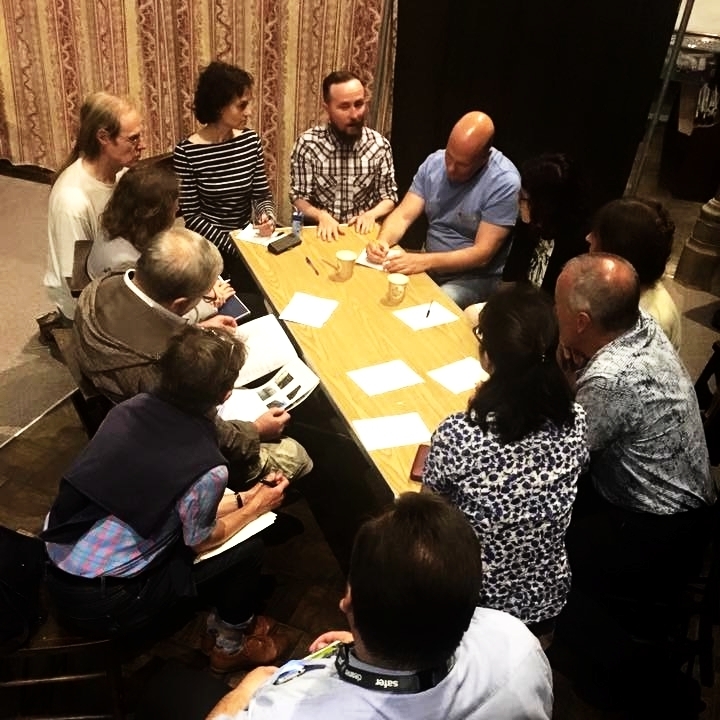 Further to our social sustainability ethos, we want to learn more about how we can grow as a practice as a result of (rather than in spite of) our involvement in community engagement activities. This topic has been recognised by Nottingham Trent University School of Architecture as a suitable subject for investigation within the context of their professional doctorate programme, and Chris has therefore been developing a formal research proposal since the beginning of January. Chris would welcome any correspondence on this subject: please read his Practice and Community blog and email him with your comments or suggestions. 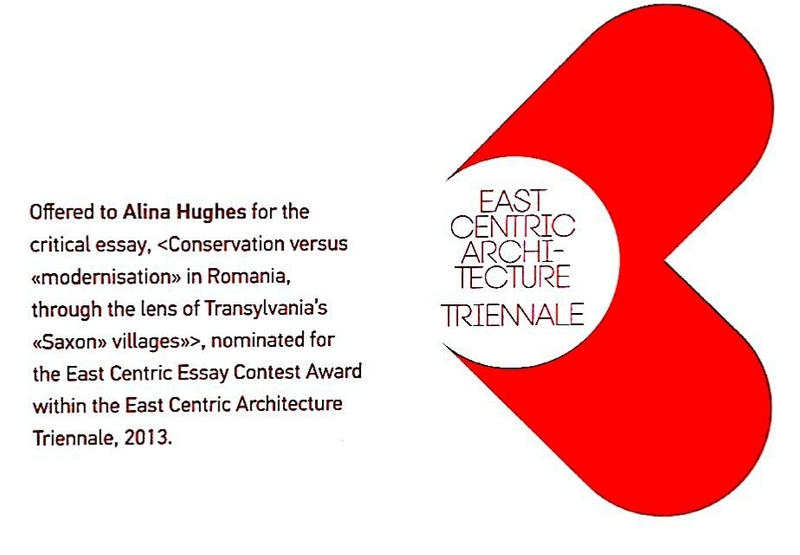 Alina is in Bucharest this week at the invitation of the East Centric Architecture Triennale — where she has presented her shortlisted entry for the Essay Contest. The jury was chaired by renowned Finnish architect and theorist Juhani Pallasmaa. Her entry, titled 'Conservation Versus Modernisation in Romania — Through the Lens of Transylvania's Saxon Villages', has been published in the Architext book 'A World of Fragments: Essays on East and Central European Architecture'. It is part of her ongoing research at Nottingham Trent University into these fascinating historic villages and the controversy surrounding their conservation by foreign agencies. We have just received a copy of the latest newsletter from TensiNet, the European network for the design and realisation of tensile structures. This issue features an article about our award-winning inflatable pavilion for the Lille Museum of Modern Art (LaM). Nice to be involved with the TensiNet people again. It's been a long time since I co-authored the chapter on the environmental design of tensile structures, in the European Design Guide for Tensile Surface Structures they published in 2004. This joint entry project, involving 2hD, Boden Associates and Shared Design, provides a beacon for projecting creative thought through a strong formal and spatial presence, connected with the surrounding canal, road and cycle routes and characterised by a light ecological touch. This Building Research Establishment (BRE) competition called for an innovative hub and ofﬁce building to link centres of excellence in the built environment with entrepreneurial business in order to promote innovative and sustainable technologies. Submitted designs were also encouraged to connect the local town community with the building and its agenda of sustainability and innovation. The brightly-clad conference theatre pod sits within a highly ﬂexible and dramatically-lit exhibition space, which in turn acts as the activity heart and connective node of the complex. The greened roof above the exhibition hall innovatively reconﬁgures the site topography providing a new habitat for local ecosystems and driving the natural ventilation inside. For this competition entry, we extensively used storyboarding techniques to communicate the social dynamics of our proposal. 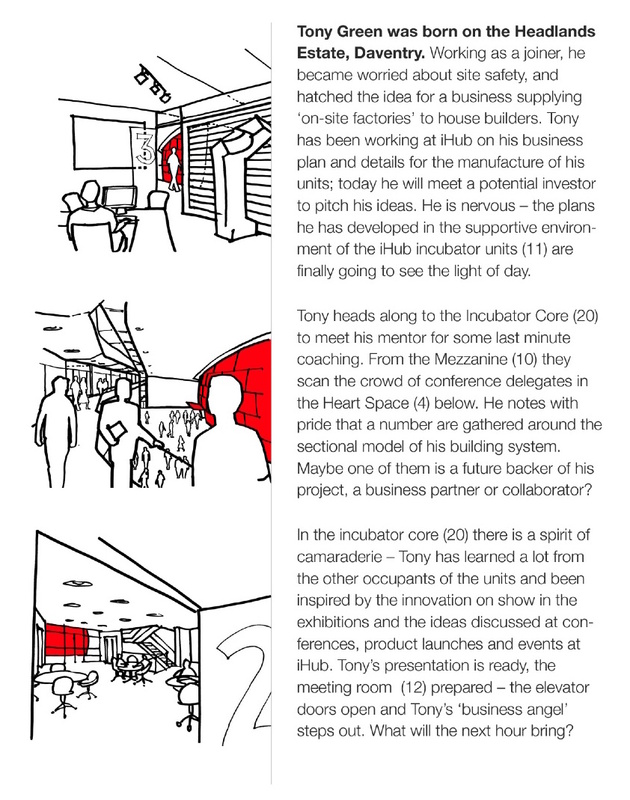 In particular, we presented the way the public would experience the spaces, from the dual perspectives of two fictional characters meeting at iHub: Tony, a resident innovative builder, and Deborah, a potential investor visiting the centre.